Comet 67P/Churyumov-Gerasimenko, as seen by the European Space Agency's Rosetta spacecraft. The online Slooh Community Observatory has kicked off "Comet Week," a series of webcasts designed to give viewers good looks at the solar system's icy wanderers. Comet Week began Monday (Dec. 7) with a show about Comet Catalina, which made its closest approach to the sun on Nov. 15 and will come closest to Earth in January. The comet is already a beautiful and impressive object when seen through binoculars, NASA officials have said. Coverage will continue at 6 p.m. EST (2300 GMT) on Thursday (Dec. 10) with a broadcast about Comet 67P/Churyumov-Gerasimenko, the target of the European Space Agency's ongoing Rosetta mission. You can watch that and other Comet Week shows at www.slooh.com or here at Space.com, courtesy of Slooh. The Rosetta mothership arrived in orbit around Comet 67P in August 2014, and dropped a lander called Philae onto the comet's surface that November in a dramatic and history-making maneuver. 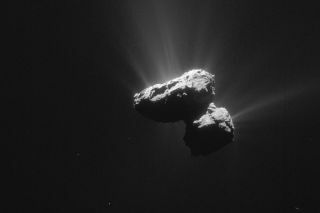 "Slooh members have been working closely with the mission scientists at ESA to track and monitor the activity of 67P over the yearlong mission, and have assembled the largest database of images of the comet on the planet," Slooh representatives wrote in a statement. "During the show, we’ll take a look at some of the best images they’ve captured so far, unveil some exciting observations and tell viewers how they can get involved in the Slooh comet program," they added. Comet Week will wrap up with a broadcast about the Geminid meteor shower — perhaps the most highy anticipated and consistently impressive of all the annual showers — on Sunday (Dec. 13), starting at 8 p.m. EST (1 a.m. GMT on Dec. 14). That's appropriate, because this year the dazzling Geminids peak overnight Sunday. During the broadcast, Slooh's Paul Cox, Bob Berman and Will Gater and The Weather Network’s Scott Sutherland will discuss the asteroid 3200 Phaethon — the so-called "rock comet" whose shed debris causes the Geminids. They'll also talk about the mythology behind the shower's name and give advice about the best ways to capture photographs of the Geminids, Slooh representatives said. Viewers can follow along via Twitter @slooh throughout the week to chat with Slooh hosts and ask questions about comets.